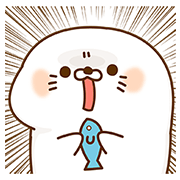 http://www.line-stickers.com/ – Stinging Tongue Seal × Uru-nyan Line Sticker | The slightly sarcastic seal teams up with the smooth-skinned Uru-nyan in a special collaboration sticker set! Double up on zingy one-liners with this unbeatable duo! Friend ORBIS’s official account to get the set for free! Available till May 8, 2017.